Seoul, South Korea -- The samurai has long intrigued the world's imagination. While much of the writing about the samurai has focused mainly on bloodletting, the samurai's strict adherence to a code of conduct is packed with many lessons that help to map a path to success. As Terukeni Uki, a samurai teacher at a martial arts near Tokyo's Imperial Palace, summed it up, the modern significance of the tradition is to teach the art of winning. "Here we teach the spirit of winning, but it's not so much defeating an opponent as overcoming one's self," Uki said in an interview with National Geographic. "These days it seems everyone is looking for someone to blame rather than focusing on himself. We're told to believe that unless you graduate from the best university and are somehow elite, you're a loser. Our message is that if you try hard, you will enjoy your life," he added. Indeed, in modern times there is lot that can be learned from the ancient spirit of the samurai to cope with the demands of an increasingly harsh and fast-paced world. Famous for their exploits in battle, the samurai always knew what they wanted, and they went to all the lengths to get it. The samurai knew the danger of dilly-dallying, and that's why they gave their all to a chosen goal. Like the samurai, you define and refine what exactly you want out of your life. Your purpose must be crystal clear in your mind that you turn neither to the left nor to the right in your quest. 2. Get the right tools. Before going into battle the samurai always checked his tools, that is, the weapons that he would use to conduct the fight. In the same vein, you must fashion yourself properly in your chosen field. You must do a check on the tools that are required in the battlefield of your chosen contribution to humanity. Without the right tools, you will not be able to get what you want. That is why the samurai always took an inventory of the weapons that were required so that he would not be found wanting at the battlefront. In addition, you must enhance your skills and competencies before you head out to the playing ground. Preparation is a key ingredient in your quest for achieving your deeply cherished goals. 3. Give it your all. On the battlefield, the samurai sacrificed everything, including his life. Not to say you have to commit suicide as the samurai did but you must give your all to your chosen path. You have to put in the time and energy to be able to reach your goal. The way of the warrior demands that you stay fully committed and determined to undergo the arduous journey that will lead to success. You absolutely have to give all your mind, heart and soul. Like the samurai, you must refuse to allow obstacles to deter you from following your dream. 4. Stay true to the code. Values are the lifeblood of success. They help you to determine and even predict the choices that you make especially in times of crisis. You need to define a code that will guide you like a compass on the journey. You must never, never compromise your principles. 5. Be at your best. 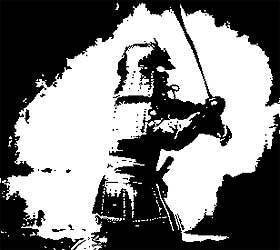 The samurai teaches that you cannot do battle when your spirit is half into it, otherwise you expose yourself to the wiles of the enemy. Excellence is not a given, it's a function of the decisions and choices that you make. When the samurai went to the battlefield, they threw fear to the side, and jumped into battle like a fish into water. Fear is like a virus. It slowly infects, then ravages your whole system, and stops you from going after what you want. But why did samurai throw themselves so wholeheartedly into battle? It is because they were crystal clear about the path they had chosen. The first thing to know is that we are never born with fear. Rather, our life experiences inject fear into our spirits, little by little, until we become immobilized to take action. But fear is also a product of having no cause in your life, not dedicating yourself wholly to that which you really want. Hesitation becomes the order of your being. 7. Get out of your way. Habit is the greatest cancer in the world. It is very to atrophy and yet still get an impression that you are alive. You can be "dead alive," so to speak. Thinking that you are enjoying your life but in reality you are simply slipping into a cesspit. The way of the warrior is to get out of your own way. Self-sabotage reduces your chances at advancement. In everything that you do, you must strive to choose what really matters. The soul is the key to all the world has to offer. There is something in life bigger than the reality of being. Being in itself is a small, non-significant speck of the whole that defines existence. In the beginless, wherein it is begotten, being makes no real choice. Something other than being is responsible for defining factors of the beginless that eventually gives birth to being. The samurai knew that sojourning in the dark valley of being yields no results. That's why he dedicated to consistently improving the state of the soul. 9. Dedicate yourself to the arts and nature. Take a cue from the samurai, and put a spark in your imagination by dedicating yourself to the arts. The arts and nature teach us that there is an endless world outside the miniscule reality of being. 10. A sword never rules. The best of the samurai knew that real power lies outside the sword but in the spirit -- the spirit to conquer self. Nothing can ever be achieved without conquering self. Self is perhaps humankind's greatest enemy in today's world. Everyone looks outside self to attach blame for failure in his or her life. They do not realize that they are equally played in contributing to the position that they find themselves in their life. Conquering self is a life mission. It is something that has to be practiced all the time. The best of the samurai knew that to be able to really and truly master the sword they had to go deeper onto their spirits to master the energy of controlling the sword. The word "samurai" is derived from the archaic Japanese verb "samurai," changed to "saburau," meaning "to serve"; thus, a samurai is a servant, that is, the servant of a lord. You must absolutely change the way you think about making a contribution to whatever cause stirs your heart. Being a leader means zero if you have nothing to offer. It's not about position. The samurai were content to serve their master to achieve a cause, using their skills and competencies. The applied what they knew to the mission that they had identified.